Today we welcome Mary Manners who's touring with her new release - Tender Mercies. CR. How did you come up with your premise? Is there a story behind your book? How did the story evolve? MM - My husband loves football, so I’ve learned to love it, too. We live near the University of Tennessee, and football is a huge tradition here. I thought it would be fun to embrace that tradition and get ‘inside’ a player’s mind for awhile. Writing Tender Mercies was a lot of fun, and my husband was pleasantly surprised by my ability to accurately weave the elements of football throughout. CR. For those who are not familiar with this story, would you please give us the blurb? When Lexi Taylor resorts to hosting an online auction to raise money for her fledgling youth center, the last thing she expects is to be matched for a date with Cooper Jackson. Lured by the premise of a lucrative NFL career, the hometown hero and former University of Tennessee quarterback broke off their engagement without so much as a backward glance. Now, six years later, he wants Lexi back. But a heartbreaking secret stands between them, and Lexi plans to keep it that way. Can Cooper’s gentleness and renewed faith coax the secret to the surface? And if he does, will forgiveness draw them close, or will their love be shattered forever? CR Are there any fun tid-bits about this story you can share with us? MM - I think my female readers will love reading about football from a woman’s point of view. CR - How did you decide on the setting? 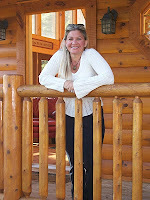 MM - I love the history and scenery of the Knoxville area and Tennessee’s Smoky Mountains…it’s so beautiful. CR - When will it be released? CR -Where were you born? MM - Just west of Chicago, Illinois in a suburb named Elmwood Park. CR – If you could live anywhere in the world, where would it be? MM - Right where I am…here in Seymour, Tennessee. Everything and everyone I love is here. CR - What hidden talent do you possess outside of writing... something you do for fun, but are good at? MM - I love to make silk flower arrangements and bake Italian food (I am Italian, after all). My husband and daughter like the baking part, too! CR - What music groups/artists blast from your CD player while you write? MM - None. I cannot write to music. I can write as chaos ensues around my house…dogs chasing the cats, kids messing up the kitchen and wrestling…but not with music. I do love to light candles, though…any fragrance that goes with the theme of my current story. CR - What are you most passionate about, other than writing? MM - I love teaching English and math to my 7th grade students. They are truly an amazing and wonderful group of kids. CR - Why did you begin writing? How long have you been writing? MM - I began writing at birth. No, seriously…I have really vivid memories of ‘writing down’ stories long before I even knew how to really print. I’d just scribble on paper and then go tell someone in my family what I’d written. CR - Do you ever suffer from writer’s block? If so, what do you do about it? CR - Are you working on anything at the present you’d like to share with us? MM - I’m working on a series about four sisters who run a bakery together in the foothills of the Smoky Mountains. They each find love in their own special way. CR - What books or authors have most influenced your own writing? MM - I absolutely love Nora Roberts. Her voice is so unique, and she really gets inside her character’s heads. I also love Karen Kingsbury and Beverly Lewis. CR - Where do you get your inspiration from? MM - I’ve been teaching for twenty-five years. Kids are a constant source of inspiration for me! MM - Wow…spare time! I think I’ve forgotten what that’s like (but it’s a good thing…to be busy writing). I love taking long walks with my husband and just sharing time with my daughter. She’ll graduate high school next year, so lots of big changes there. CR - Do you really, really want a dog? MM - I really, really have TWO dogs and TWO cats…all rescued from local animal shelters. I love them all, but no more pets, please! CR - Do you hate how you look in pictures? CR - What is your strangest habit? MM - When the weatherman predicts snow, I run the belly of an illuminated snowman my husband gave me last Christmas—lots of snow means lots of time to write! CR - Are you a morning person or a night person? MM - I am definitely a morning person. I like to get up by 4:00 and write before school. But the older I get, the earlier I go to bed. CR - If you could see anyone tomorrow (dead or alive), who would it be? MM - Oh…this one’s easy. I’d see my dad, who died of cancer nine years ago. I miss him so much. Lexi hasn't seen Cooper since he walked out on her six years ago, choosing a career in football over a relationship with her. Being won by him in a dating auction is the last thing on her mind, but the charity she founded for kids desperately needs the money. She reluctantly agrees to the date, but on her terms. There is too much history between her and the handsome footballer for her ever to forgive him, not that he'd forgive her if he knew her secret. Neither Cooper nor Lexi came out of the relationship unhurt and their reunion is bittersweet to say the least. This novel by Mary Manners is a real treat. With charming, full bodied characters, it's plot kept you from the housework as I found myself sneaking back to it, eventually giving up on housework until I'd finished reading. A heart warming tale you don't want to miss. Lovely interview, ladies - and a wonderful review! Mary, it's so much fun learning a little more about you with every interview you're doing. I was beginning to think I was the ONLY writer in the world who cannot write with music playing - even though I love music! LOL Like you, I can work with things going on around me. As a mother, I kind of had to learn to do that. But I actually prefer to write in complete peace and quiet. 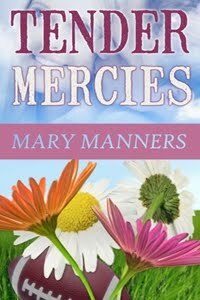 Still looking forward to reading Tender Mercies, and already trying to decide what your heroine's secret is. Love the anticipation! Wow, you beat me to the post!!! It's good to know there's someone else who can't write to music. I find it amusing that so many writers can. I guess because I am also a teacher of middle school kids, a mother, and a wife, I really love when I'm surrounded by a bit of peace and quiet for my writing. Thanks for stopping by, and I hope you learn Lexi's secret soon. Loved learning even more about you, Mary! I really thought I was weird not to listen to "mood" music when I'm writing. I do so much better without any distractions. But, I do have a "Creative Mind" cd which I put on occasionally. It's like white noise in that it's not distracting and you can't hum or sing along. Sometimes that helps when I'm sitting staring at a blank page. Thanks for stopping by, Carol Ann! I find the whole music concept quite interesting. Mood music...I'll have to try that sometime, too. I'm thinking ocean waves...what could be more romantic??? For me... if I'm writing snow then I play the sound track to Alive. For my firefighter WIP there's a lot of Backdraft if its a fire scene. Fight scenes would be Armageddon. Weddings...well that would be Olympic Spirit - the piece I walked down the aisle to. Great post, ladies, and wonderful interview/review!! :-) I, too, crave peace when I write. I find TV, chatter and music distracts me from building the scene, so I try to tune out (when others are near - LOL!) or go to a place in the house where I can completely focus and lose myself in the story and characters. Great getting to know you, Mary, and congrats again on the release of Tender Mercies!!!! Thank you, Clare, for the wonderful post and the great discussion. I'm learning a lot about the influence of music/sound in writing. Hope you are all having a good Monday, and staying warm and dry. Wow, changes are coming with your daughter graduating HS soon. Does she know what she'd like to do yet? I enjoyed your interview. Nice job, ladies! Thanks, JoAnn. Yes, there are big changes on my horizon! My daughter thinks she would like to be a physical therapist for older adults. She is really good with older people, and has had a lot of experience through mission work with our church. Wonderful interview and great discussion. I just picked up your story - can't wait to read it! Hi Mary, what a terrific post. I enjoyed getting to know you a bit better. The pic is marvelous, and I already have TM on the TBR list...soon as it hits Kindle. I too miss my late dad more than I can say, and I love DOGS! Clare, thanks for featuring Mary today. Hugs to you both.